Researchers at the University of Dundee have developed hugely powerful new microscopy techniques which can fully visualise a key stage in the development of embryos for the first time. Determining the mechanisms behind the early development of embryos is key to understanding the causes of many birth defects as well as disease in later life. One of the earliest and most critical stages in embryo development is gastrulation, which in mammals, birds and reptiles is characterised by the formation of the primitive streak. Gastrulation results in the establishment of the main body axes and is accompanied by extensive cell rearrangements, driving large scale three dimensional tissue deformation and reorganisation. However, in order to understand the mechanisms behind this key stage in embryonic development, previously unheard of imaging capabilities were required. The Dundee team – working with colleagues at the University of Edinburgh and the Technische Universität in Dresden – has now developed the tools which have enabled them to capture in real time the formation of the primitive streak in a chick embryo. The interdisciplinary collaboration comprising physicists Dr Mike MacDonald and Dr Emil Rozbicki, computer scientist Antti Karjalainen and life scientists Professor Kees Weijer and Dr Manli Chuai, have adapted and applied a hugely powerful new microscopy technique to fully visualise critical cell behaviours on the scale of the embryo during this key stage in development for the first time. This means they were able to watch the tissue flow and rearrangement of more than 100,000 cells as they organise themselves in the embryo at a crucial early stage as it grows and develops. The technological breakthrough allows greater biological insights to be made into this early stage of life. Professor Weijer said, “Previous work in this area has either looked at animals which are less similar to humans in their development or with imaging techniques which only give a partial picture of what happens in the embryo. “What we can now see is a much more complete picture, which will allow a far greater level of understanding and analysis of the cell behaviours that underlie the changes in tissue shape and organisation confirming and refuting different proposed theories. “These insights will form the basis required for the next steps in the investigation of the molecular mechanisms and forces that control and coordinate these complex cell and tissue behaviours”. 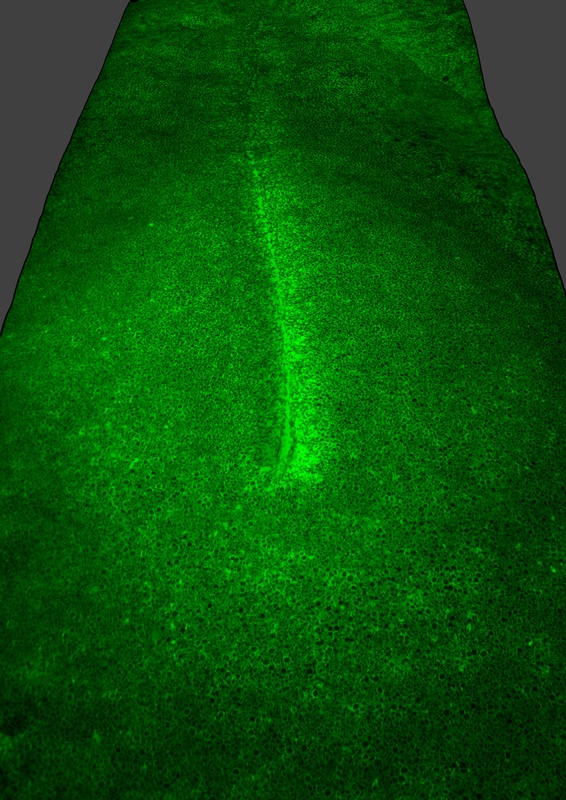 The researchers used a technique called light-sheet microscopy combined with extensive computational data analysis to visualise this critical stage of development. During this process the researchers captured typically 2000-4000 optical sections through the embryo at 2-4 minute intervals. This produced a three-dimensional reconstruction (8000x5000x280 voxels) of the embryo, and extremely high-resolution two- and three-dimensional images which enabled the observation of individual cells performing complex but highly orchestrated behaviours in living chick embryos. The technological breakthrough enables researchers to generate images with the resolution to see individual cells, but the image size to view an entire embryo. “To see the `big picture’ of what happens during the formation of the primitive streak is a massive task and one that required us to adapt existing equipment and develop new techniques to make it possible,” added Dr Mike MacDonald, Leader of the Biophotonics Group at the University. Videos of the process can be viewed at http://www.nature.com/ncb/journal/v17/n4/fig_tab/ncb3138_SV1.html and http://www.nature.com/ncb/journal/v17/n4/full/ncb3138.html#videos.